The past few days have reminded me of that television show many of us watched every Sunday evening when we were kids: ‘Wild Kingdom.” Only none of this was on TV. Thursday one of my son’s speech therapists, Ally, and I took Harrison fishing at a pond on a nearby neighbor’s ranch. As we were setting up the fishing rod, we heard flapping and screeching, and looked skyward to see two golden eagles attacking a blue heron. The eagles knocked the heron to the ground on the bank opposite us. As they dove, the heron flopped over into the water. I thought for sure the heron was mortally wounded. I waved my arms and yelled at the eagles and they reluctantly gave up the hunt. The heron flew a few feet and settled back in the water along the bank. Then a few moments later it took flight and winged away. Early Friday morning I woke up to the sound of an alarmed chicken. I walked outside and caught a coyote chasing one of my hens in the front yard. My dog Sam zoomed out the door and chased the coyote away, but then the coyote spun around and attacked Sam. Sam backed off and the coyote ran in the opposite direction. Sam once again chased (all the while I was yelling at my dog to stop but he was practicing selective hearing). The snarling coyote once again turned and charged the dog. This went on about four times before I headed up to haze the coyote away. It was last seen galloping across the pasture. All chickens have been accounted for. Recently I found a dead pigeon along the side of the road in a neighboring subdivision where I often run. The bird seemed large and was brilliantly colored. I turned it over and found a deep cut just above the breast. I turned around and looked up — power lines. Obviously the bird had flown right into a wire. But the real mystery remained: What’s a pigeon doing up here in the Wet Mountains? I went home and did a little research, finding a description of the wild bandtailed pigeon on the Internet. The next day I ran back over and checked the bird again. Sure enough, it had orange legs, and an orange beak with a black tip. The dead pigeon was a wild bandtail. 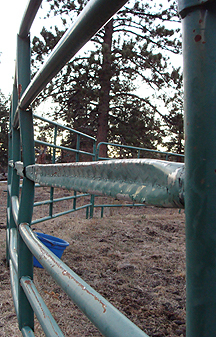 My friend and favorite old rancher guy, the late Virgil Lawson, once told me how to straighten out a bent steel corral panel — by driving a truck over it. I’ve been eying a bent panel since a horse snafu over at the ranch earlier this summer. So today I decided to give it a try. I set the panel down in the driveway and lined my truck tire over the most-bent round tube. Well, it straightened out the panel, all right, but it also flattened the round tubing and left a herringbone tire-tread pattern in the metal! I thought I heard Virgil’s hearty laugh from somewhere up in the sky, but the truck certainly took the bow out of that panel. My friend and neighbor Kevin called this morning and told me about a dead buck deer near here that had a golden eagle feeding on it. I drove over to take a look and found local Colorado Division of Wildlife District Wildlife Manager Justin Krall conducting an autopsy of sorts. He wanted to rule out the possibility the deer had been shot. With the hide peeled back, no bullet holes were revealed, though there was one small puncture in the skin. Oddly there appeared to be some slits in the carcass that were not accompanied by matching cuts to the hide. From what he saw, Justin thought the deer died from internal injuries, either from fighting with other bucks, or from a run-in with an automobile, though there was no evidence of skid marks or vehicle debris on the road nearby. He took the head to test for chronic wasting disease. He said that the DOW has tested about 300 deer from this area in the last year and found no cases of CWD. 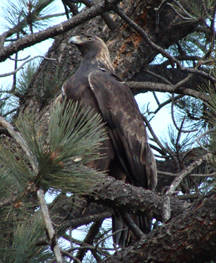 Later I drove back to the scene and found the eagle had returned along with a flock of magpies. The big bird lifted off the carcass and landed in a nearby tree where I was able to get an up-close photograph. Condolences go out to the family and friends of a 65-year-old Custer County man who died last week after he was reportedly thrown from a mule while riding near his home in the Antelope Valley area southeast of town. Apparently Jerry Gregory’s neck was broken in the fall, and while it’s been labeled a freak accident, it is a reminder of the dangerous nature of equine activities. A mule is a hybrid between a horse and a donkey, and can be quicker and more powerful than either of its parents. I’ve had horses try to unseat me, but it’s been the donkeys that have put me on the ground. Twice I was dumped when donkeys spooked. Another time I was riding a slight downhill at a trot when my burro Ace stumbled and literally went down on his nose, pitched me over his shoulder and nearly rolled over on top of me. I landed with my forehead and shoulder hitting simultaneously and scrambled mightily to get out of the way. Despite these wrecks, I still prefer riding a donkey because they rarely buck and are not inclined to run away for great distances like a horse. Generally, if spooked, a donkey will run a short distance, then turn back to see what scared them. Usually you can ride it out until they stop.